Roxy Ramirez has saved up for weeks to buy a chemistry set, and now she’s headed to the toy store to buy it! There’s only one problem: along the way, she keeps running into friends who are in trouble, and need her to dip into her savings to help. Will she have enough money left over to buy something for herself? Especially designed for kids 4-6, It’s Not Fair! 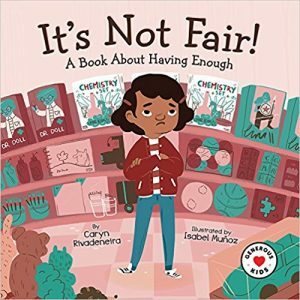 teaches kids about money, choices, generosity, and what it means to have enough.